In my last post, I talked about the new developments in FlowSightTM that provide a better connection between simulation setup and post-processing in relation to visualizing geometry features. Continuing the theme, I will discuss the improvements to volume rendering and the new case linking features in FlowSight. 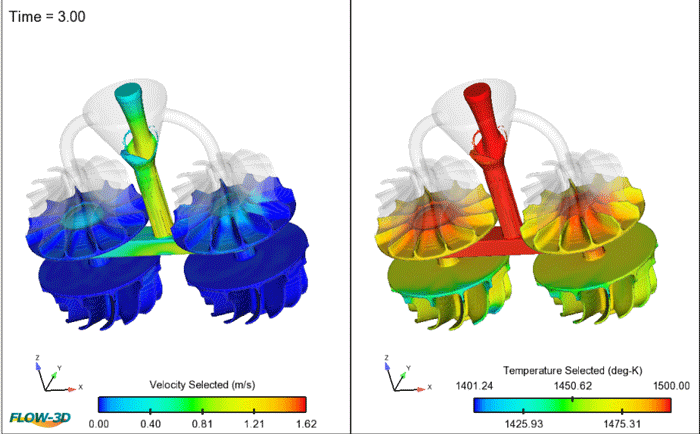 Volume rendering is a very powerful way of looking at simulation results. However, it is computationally intensive as it directly displays 3D volume data as a pixel map instead of drawing a surface by creating polygons or triangles. This computational burden can be reduced in FlowSight using a new feature called Stencil. Another improvement, Filters, provide the ability to create a volume render that only shows a specified region. I will explain more about how you can use these features to improve your workflow in the following sections. Stencils control the resolution of a volume render. The default value of the stencil is 1 in all the directions, which means that all mesh cells will be used. 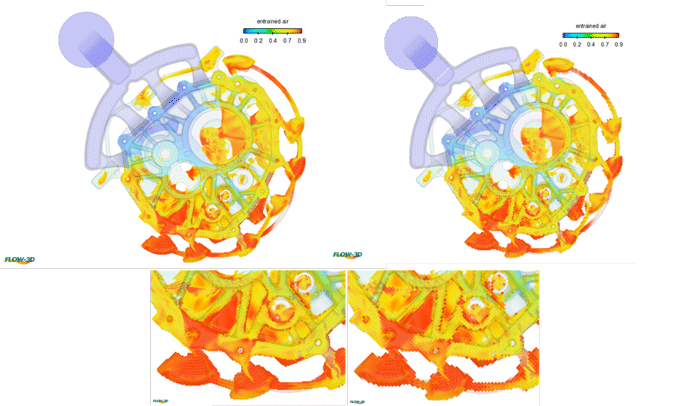 Increasing the stencil size coarsens the volume rendering, reducing the time to create the rendering and providing comparable visualization depending on the original mesh resolution. Stencils can only be set during their creation and cannot be modified later. A comparison of two volume renderings with different stencil sizes is shown below followed by a table that shows performance improvements as the stencil size varies. Volume render time comparison showing performance improvement with increasing stencil size. Comparison has been done for mesh cell count of 15 million. 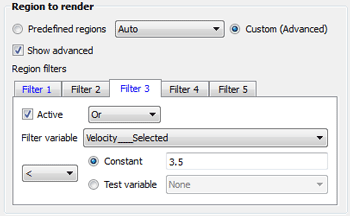 The Filters option allows the user to define the region where a volume render should be created. Using Filters, the user can specify to create a volume render only in Fluid 1 or only in the Solid region. There are seven predefined filter options shown below. The options include 6 surfaces: fluid 1, void, solid volume, open volume, liquid fluid, solidified fluid and auto. This last is the default option, and it selects the filter based on color by variable. 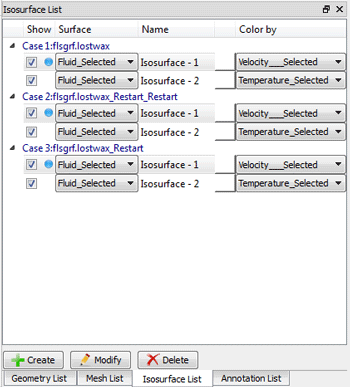 In addition, FlowSight allows the user to create up to five custom filters (shown below) that work in combination of and /or logical operators. Volume render comparison with (right) and without (left) filter. Fluid-1 has been chosen for filtering. Sometimes a simulation is intentionally (or unintentionally, for example, due to a computer crash), broken into a series of restart simulations. But, the user may still want to see several data sets in one continuous timeline/animation. The user can use Case Linking feature to create a single animation from a simulation and associated restart simulations so that the entire timeline/process can be seen from the start of the first simulation to the end of the last restart simulation. The Case Linking feature controls the overall visibility of a case. Based on the link times, only the case valid at a current time will have its parts available in the display. 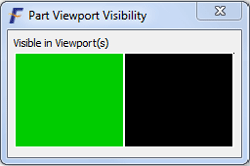 The user needs to correctly set the Viewport visibility. So, in the example below, we want to a create a single animation from three cases with the left viewport showing fluid isosurface colored by the velocity and the right viewport showing fluid isosurface colored by the temperature. So, to achieve this, “Isosurface-1” for all the three cases must be made visible only in the left viewport and similarly “Isosurface-2” for all the cases must be made visible only in the right viewport. For new FlowSight users, I would like to briefly explain how viewports work. The FlowSight window can be divided into multiple sub-sections or viewports. Each viewport can have a different view, different iso-surface, etc. Multiple viewports provide flexibility to the user to study and perform an action on the same simulation in different ways while visualizing them simultaneously. For example, a velocity isosurface can be seen in one viewport, a temperature isosurface can be seen in another viewport, a volume render can be seen in the third viewport, and so on. Once the viewport visibility is set correctly, an animation can be captured from the Create animation dialog. One such animation is shown below that uses the Case Linking feature. Video highlighting the new Case Linking feature of FlowSight where multiple simulations were sewn together to generate one seamless animation. This post focused on reducing the computational burden while creating volume renders and linking multiple simulations to create a single seamless animation. In my next post, I will talk about the improved Preferences option in FlowSight.